Copyright © 2019 PWS West. All Rights Reserved. Today's Speed Queen washer-extractors are dual phase machines and work in both single-phase and three-phase electrical configurations. Most models are 220 Volt, although there are a few models that work in a 110V application. Speed Queen washer-extractors can be activated or started using coins, cards, or push-to-start (non-metered). Coin and card applications are mainly used in laundromats, while non-metered washers are used in other industrial / commercial applications such as hotels, motels, salons, gyms, campgrounds, etc. Has the features of the Quantum Silver controls, but adds: Wireless Networking, Profitability Reports, Customer Selected Price Modifiers, Computer Audit, Computer Programming, Auto Dispenser Flush, Auto Shutdown Assistant, Break-In Alarm, Drop Off Mode, Lucky Cycle, OPL Mode, Power Saving Mode, Remote Vend. Main features are Multi-Level Pricing, Pause and Resume, Slow Drain Detection, Water Leak Detection. Only available on some non-metered washer-extractors, this control panel offers basic machine management with reliability and energy efficiency. G-Force is used to compare washer extraction speed and moisture removal. The higher the G-Force, the more water is removed during extraction. When more water is removed during the wash load, the load will dry faster. While machines get more expensive the higher the G-Force, high extraction leads to increased throughput and lower dryer gas bills. Speed Queen washer-extractors come with either stainless steel or vinyl clad side panels. Most customers purchase models with vinyl clad panels because their durability is similar to stainless steel, but are offered at a lower price point. With Quantum Gold, you can wirelessly connect your equipment through your wi-fi network. What that means for you is that you can program, monitor, audit, and diagnose your networked machines from any Internet-linked computer, anywhere in the world. With up-to-the-minute data on store activity, you can make the most informed business decisions regarding pricing, service needs, advertising, and promotions. Today's Speed Queen softmount washer-extractors are dual phase machines and work in both single-phase and three-phase electrical configurations. Most models are available in 220V or 440V. Speed Queen softmount washer-extractors are non-metered and are activated with a push-to-start button. Non-metered washers are used in industrial / commercial applications such as hotels, motels, salons, gyms, campgrounds, etc. Speed Queen softmount washer-extractors up to 70 lbs. come with the QED Select control. This control has 99 preset programs, multi-lingual support, and customizable wash programs. The display allows users to follow the status of every phase of the wash cycle and make changes at any time for maximum efficiency. The 90 and 125 lb. washer-extractors come with a Micro Control, which has a graphical display and features such as cycle programming, delayed start, error counters, and error log. 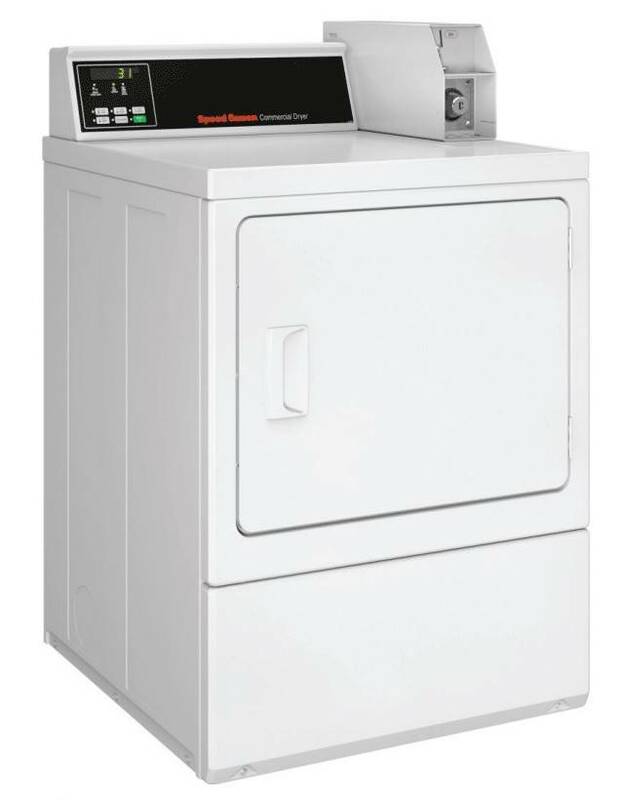 Speed Queen's single pocket tumble dryers can be activated using coins, cards, or push-to-start (non-metered). Coin and card-operated machines are used in laundromats, while non-metered dryers are used in industrial / commercial applications such as hotels, motels, salons, gyms, campgrounds, etc. Speed Queen offers their revolutionary Quantum Gold system on their single pocket tumblers, as well as more basic control options. Designed to reduce expenses and maximize revenue, Quantum Gold combines equipment controls, programming, reporting, wireless networking, and much more, into one full-store management system. This is available for both metered and non-metered applications. Quantum Gold can be equipped with an optional moisture sensor (Over-Dry Prevention Technology, or OPT), to prevent over drying, which saves time and energy. The Micro Display Control allows for manual programming and the LED panel displays vend price and time remaining in the dry cycle. Metered applications only. Only available on non-metered equipment, the Dual Digital Control features one touch cycle repeat, automatic extended tumble, and a large digital countdown display. Speed Queen single pocket tumblers come in gas, electric, and steam models. A reversing cylinder ensures even drying and prevents tangles for easy removal of loads. Speed Queen's stack tumble dryers can be activated using coins, cards, or push-to-start (non-metered). Coin and card-operated machines are used in laundromats, while non-metered dryers are used in industrial / commercial applications such as hotels, motels, salons, gyms, campgrounds, etc. Speed Queen offers their revolutionary Quantum Gold system on their stack tumblers, as well as more basic control options. Speed Queen stack tumblers come in gas, electric, and steam models. With Quantum Gold, your equipment can be networked, allowing you to program, monitor, and control your store remotely.